We cannot believe the changeable weather we’re experiencing this year. We have thoroughly enjoyed the sunshine and managed with the odd splashes of rain and even snow and hail today! Lambing is well underway - at this point we have lambed approx. 50 of our 240 sheep which are in lamb. We are pleased that so far most are growing well and we have even managed to get some outside living on the grass already. All doing well, lets hope the sunshine stays! The lambs spend the first day and a half in a small pen with their Mums. Other exciting news on the farm is that we are currently advertising for someone to come and work with us on the farm. Look at our job advert here. If you are interested in applying or know someone who is then please do get in touch! The education centre has welcomed visits from a couple of new school groups and education groups which has been fantastic - we’ve had a great time introducing children to our little lambs. Sadly, we are saying goodbye to a couple of our office tenants who are moving premises or downsizing but it does mean that we now have two office spaces available to let. Again, please do get in touch if you’re interested in working here at Greatworth hall. I think it’s fair to say that there is lots of change here, but we are looking forward with optimism and hope for 2019. 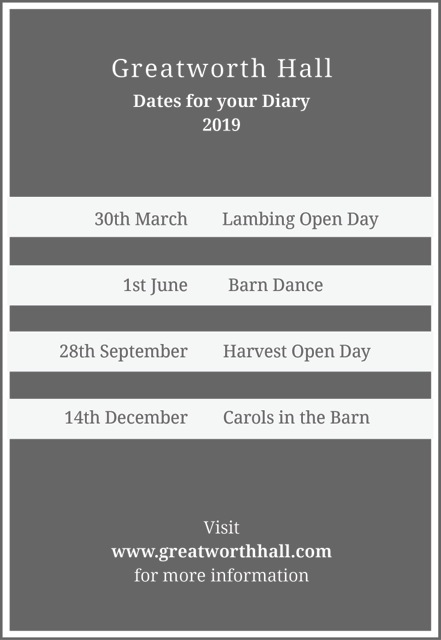 We are enjoying all the work we are doing and feel a sense of adventure as we look to do the above events and welcome others to come and work here on the farm with us and in the offices that we let out. There’s a great sense of community here, particularly since welcoming Rebecca at Hole in the Hedge cafe. HS2 and Brexit are scary because of the unknown but we feel that the best way to carry on is to look for the opportunities in the face of these threats. We are remaining positive. Posted on March 10, 2019 by Greatworth Hall. Posted on January 16, 2019 by Greatworth Hall. …The past academic year of school visits has been absolutely fantastic, we finished with a total of 50 visits throughout the year which was a real blessing to host…. Posted on August 21, 2018 by Greatworth Hall. Last October I was encouraged to put the Farm Education Centre in for the BayerFACE awards. 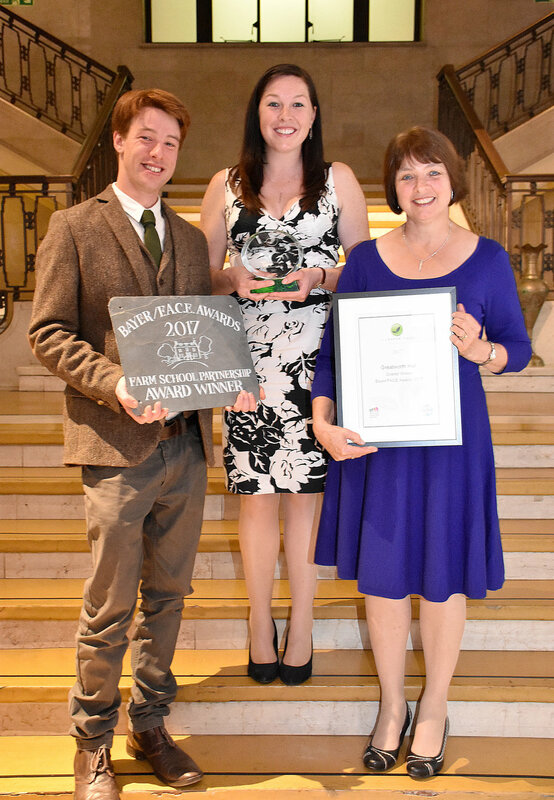 These are National Awards celebrating excellent farm based education. Bayer (cropscience) and FACE (farming and countryside education) join together biannually to hand out awards for providers of education on farms. We were delighted earlier this year to receive an invite to the Banking Hall in London to join with others who were shortlisted for the awards. The category we had entered for the awards was the Farm School Partnership; the description of which was as follows; For a farm fostering successful relationships with one or several schools, making a valuable and sustained contribution to school life both on and away from the farm. This might include contribution to curriculum activities, helping with growing activities or developing an ongoing programme of learning. My heart returned to it's normal pace and between the three of us we exchanged ecstatic glances and proud smiles, now more confident that we're doing a really good job here. Mum sent Dad a text (under the table like a distracted school pupil) and we listened as the last two very worthy winners were announced for their category. Finally, the overall winner was to be announced - we didn't realise there was such an award as an overall winner. We assumed this was an award for someone else who had blown us category winners out of the water with exemplary work. To our astonishment....our name was announced! Now teary, feeling so incredibly honoured to have won, I went to collect the award. We were all so glad to be the winners of the award, it adds value to the work we are doing here and has helped us to really recognise the positive impact we're having on young lives. Posted on October 5, 2017 by Greatworth Hall.